CHICAGOÂ and OXFORD, England, Feb. 11, 2019 /PRNewswire/ -- MarketsandMarketsâ¢, the world's largest revenue-impact research and advisory firm focused on high-growth niche markets, and Oxentia, Oxford's Global Innovation Consultancy, today announced a new strategic partnership. As part of the agreement, Oxentia will leverage MarketsandMarkets' cloud-based market intelligence platform,Â Knowledge Store,Â as well as their suite of business intelligence services to bring more comprehensive marketplace and revenue intelligence, analyses, and research & development services to its clients across the globe. Dr. Steve Cleverley, Oxentia's CEO, remarked, "Oxentia is pleased to partner with MarketsandMarketsâ¢ to provide our global client base with deep market knowledge to assist in the generation of value from early stage technologies. The intelligence and insight provided by the Knowledge Store will help our clients in universities, corporates, and startups to create winning, market-led strategies to bring their new ideas to life." Established in 2004, Oxentia is a key part of Oxford's innovation ecosystem, and helps its public and private sector clients build capacity, develop capability, and enable innovation for the benefit of economies and societies. Their expert team of consultants provides advice, guidance, consultancy, and training, from concept to commercialization. By combining MarketsandMarkets' Intelligence services, market sizing, technology assessments and roadmaps, forecasting, and competitive analysis withÂ Oxentia's broad technical subject matter expertise, the two organizations will leverage research capabilities to broaden their coverage. They will also conduct joint workshops and other educational seminars to enable global clients to capitalize on new and emerging opportunities. 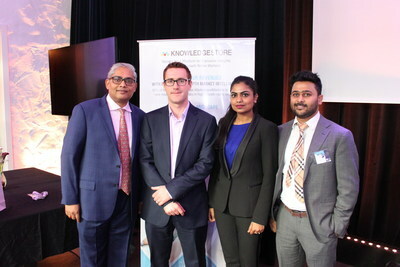 "MarketsandMarkets' insight into connected and converging markets coupled with Oxentia's depth of experience and breadth of sector coverage will provide clients with a 360-degree view of how emerging opportunities will impact business outcomes," said Sandeep Sugla, CEO and founder of MarketsandMarketsâ¢. "We are excited to work with Oxentia to deliver the market intelligence needed to devise long-term growth strategies." "We remain committed to supporting client revenue decisions by providing the most comprehensive competitive intelligence available," said Shelly Singh, Chief Operating Officer of MarketsandMarketsâ¢. "This strategic partnership is a testament to that commitment and we look forward to strengthening our relationship with Oxentia in the years to come. Additionally, Europe is a key strategic market for MarketsandMarketsâ¢ and we have invested heavily in our presence and client services footprint there led by our Head of European Operations, Pavan Palety." MarketsandMarketsâ¢ is the world's largest revenue-impact research and advisory firm, helping more than 80 percent of Fortune 2000 companies identify new high-growth and niche revenue opportunities. In the face of constant technology innovation and market disruption, MarketsandMarketsâ¢ helps organizations plan and operationalize their future revenue mix decisions by identifying over 30,000 high-growth opportunities ranging from $1B to $500B across over 90 industries and markets. Organizations choose MarketsandMarketsâ¢ to stay ahead of the curve and accelerate their revenue decisions and implementations by 6 â�“ 12 months, giving them a unique first-mover innovation advantage. Its revenue impact methodology provides actionable and quantifiable insights on converged, granular and connected market eco-systems that result from disruptive technologies and high-growth markets. MarketsandMarketsâ¢ provides an exte! nded lens on not only what will impact its client's revenue but also what will impact their customers' revenues, continually uncovering latent opportunities. Serving C-level executives in functions such as strategy, marketing, sales, R&D, product, and M&A across all major B2B industries, MarketsandMarketsâ¢ brings exclusive high-growth markets intelligence generated by over 850 SMEs and analysts along with its proprietary revenue impact platform, Knowledge Store, to support decision making. For more information, visitÂ https://www.marketsandmarkets.com/Â or follow on TwitterÂ @MarketsMarkets. OxentiaÂ is an innovation management and technology commercialization consultancy that started life as an operating division within the world leading technology transfer company of the University of Oxford, Oxford University Innovation. Oxentia works in partnership with their global clients to build capacity, develop capability and enable innovation for the benefits of economies and societies. Since 2004, Oxentia has delivered services to a worldwide customer base of public and private sector clients in over 64 countries and is a key part of Oxford's innovation ecosystem.